On February 6, 2017 Synapse released a report on “New England’s Shrinking Need for Natural Gas. ” This report examines the need for, and the cost of, the Access Northeast (ANE) natural gas pipeline. As proposed, the ANE pipeline relies on a novel funding mechanism whereby electric ratepayers would pay for new gas pipelines. This unprecedented funding proposal has spurred controversy and litigation: the Massachusetts Supreme Judicial Court and the New Hampshire Public Utilities Commission both rejected this approach, declaring that it violates state laws enacted to restructure the electric utility sector and to protect consumers from undue financial risk. Pipeline proponents claim that the ANE pipeline is needed to relieve capacity constraints on New England’s natural gas pipeline system and that the cost of the pipeline is justified because it will ultimately save money for New England electric ratepayers. Our analysis shows otherwise. Any savings created by the ANE pipeline are likely to be outweighed by its costs, which are more than twice what proponents have generally reported. Our analysis also indicates that the need for natural gas in New England will decrease dramatically within a few years of ANE’s construction. This would alleviate the capacity constraints cited to justify the pipeline. We modeled energy use, prices, and emissions in a base scenario in which there is no new pipeline (Base Case) compared to a scenario in which the ANE pipeline is constructed (Pipeline Case). First, with or without a new pipeline, existing laws and regulations will cumulatively require New England’s use of natural gas for electric generation to decrease by 27 percent by 2023, relative to 2015 levels. 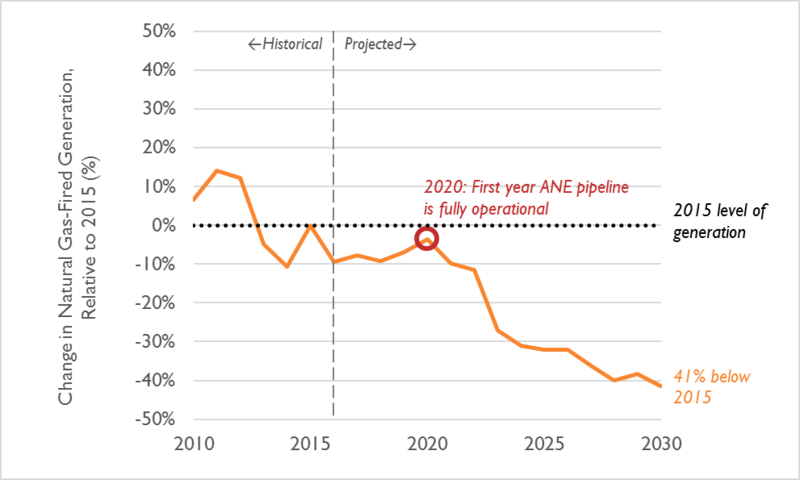 Natural gas use is forecasted to decline dramatically in 2023—just a few years after the ANE pipeline is supposed to be fully operational (see Figure 1). Existing laws such as renewable portfolio standards, energy efficiency resource standards, long-term requirements for additional hydropower and wind power, and carbon dioxide (CO2) emissions caps will require a significant reduction in natural gas-fired generation throughout New England. This decrease in overall gas use will reduce capacity constraints of existing pipelines and the need for new pipelines. By 2023, shortly after ANE’s construction, natural gas-fired generation is estimated to be 27 percent lower than in 2015. And by 2030, natural gas-fired electric generation is estimated to be 41 percent lower than in 2015. Second, the ANE pipeline will cost New England consumers $6.6 billion, not $3.2 billion as previously reported. Proponents of ANE publicized an expected pipeline construction cost of $3.2 billion. However, according to expert witness testimony for Eversource, one of the main project proponents, after taking into account additional costs, including operations and maintenance, depreciation expenses, and return on equity, the ANE pipeline is expected to cost $0.5 billion per year for 20 years—about $6.6 billion in present value terms. The pipeline developers seek to charge these costs to electric ratepayers throughout New England. Third, if the pipeline is built, New England ratepayers will pay additional costs of $277 million over its lifetime. Even if the ANE pipeline reduces constraints and gas prices, it will cause overall price increases for consumers throughout New England due to the cost of the pipeline itself. The pipeline is expected to impose net costs of $277 million on all New England electric ratepayers on a present-value basis. Fourth, if the pipeline is built, electric ratepayers in Massachusetts and Connecticut will pay additional costs of $141 million and $85 million, respectively. Massachusetts ratepayers will see cost increases associated with the ANE pipeline. Our analysis shows that Massachusetts electric ratepayers will pay additional costs of $141 million over the life of the pipeline. Connecticut ratepayers will be looking at additional costs of $85 million over the lifetime of the pipeline. If the pipeline were built without the support of electric ratepayers in Massachusetts and New Hampshire, the costs to Connecticut ratepayers could be as high as $1.9 billion. The Connecticut Department of Energy & Environmental Protection has stated that this approach would burden the state’s ratepayers with disproportionate costs. Fifth, implementing emission reduction mandates and targets under each New England state’s global warming solutions laws will likely cause economy-wide natural gas use to decrease by 20 percent by 2030, despite recent policies and trends that incentivize fuel-switching to natural gas. In recent years, as the price of natural gas has dropped compared to other fuels, many New England consumers have switched their home and business heating systems to natural gas. At the same time, some states have prioritized natural gas fuel-switching, including Connecticut as a part of its Comprehensive Energy Strategy. However, in order to attain greenhouse gas reductions in line with the scientific consensus on averting catastrophic climate change—and to comply with state laws intended to achieve this reduction—all of the New England states will have to go even further to reduce greenhouse gas emissions. Achieving the greenhouse gas emission reduction goals of the six-state region will require economy-wide CO2 emissions in 2030 to decrease by 40 percent, relative to 1990 levels. Additional regulations will probably be needed to reduce emissions from residential and commercial buildings, as well as from transportation and industrial uses. These policies will promote more reductions in natural gas, beyond the electric sector. Synapse also modeled two additional scenarios (with and without the ANE pipeline) in which each New England state imposes more stringent emissions caps to comply with legal mandates or agreements under the Global Warming Solutions Act or similar legislation and targets. Even after accounting for expected fuel-switching and other load growth in the non-electric sectors, total natural gas use in these scenarios is expected to fall by 20 percent, relative to 2015. This will further reduce the need for ANE and other natural gas pipeline infrastructure. Our modeling shows that if the ANE pipeline is built as proposed, ratepayers will bear substantial net cost increases on their utility bills, even if the pipeline alleviates winter price spikes. Furthermore, within several years of the pipeline’s construction, the overall need for natural gas in New England’s electric sector is expected to decline dramatically as states work toward compliance with existing laws and regulations. The decline in natural gas use for electric generation indicates that even existing gas pipelines may operate under capacity and that ANE—or other new pipeline infrastructure—will not be needed to supply either electric generators or gas heating customers. Under these circumstances, spending $6.6 billion on a new pipeline meant to provide natural gas year-round to electric power plants is not a reasonable or cost-effective way to address pipeline capacity constraints.